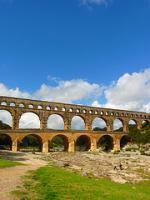 Pont du Gard (Roman Aqueduct) is one of the oldest and most remarkable Roman hydraulic works. The bridge is 48.77m high, has three levels and was built in ca. 20 BC (newer excavations, however, suggest the construction may have taken place between 40 and 60 AD). 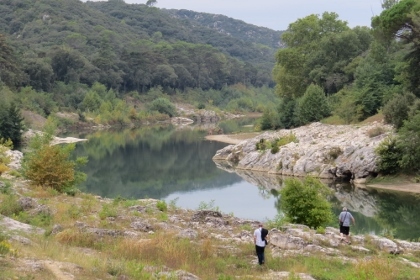 It crosses the river Gardon near Nimes (south of France). The aqueduct originally carried water from a source at the Fontaine d'Eure near Ucetia (Uzès) to a delivery tank or castellum divisorum in Nemausus (Nîmes), from where it was distributed to fountains, baths and private homes around the city. Although the straight-line distance between the two is only about 20 km, the aqueduct takes a winding route measuring around 50 km to avoid the Garrigue hills above Nîmes. Even when you arrive on foot, entrance to this site is not free any more. The walking path from the bus stop to the visitor center conveniently passes the ticket booths that are set up to sell drive by tickets for cars. There may be ways around paying it (especially when it is a busy day in summer), but that would not be easy for a first time visitor. My 10 EUR ticket wasn’t checked anywhere further on the premises, not even at the “museum”. The visitor center has been a relatively recent addition to the site, and is said to have improved the visiting experience. Fortunately I went there on a quiet autumn day, but the center clearly was built for receiving masses. The toilets and a relatively cheep & cheerful self-service cafeteria were OK though. I only visited the museum exhibition on my way out – there aren’t any unmissable pieces to see, but I came to know some worthwhile facts from the displays and multimedia presentations. Such as how the aquaduct fell into decay relatively quickly. It has been used for about 150 years, but the water quality deteriorated fast after the initial streams of water passed. It wasn’t good enough anymore to fill the city’s baths, and was only used in agriculture. The exhibition also states that the Roman aquaducts around Europe were built as “stone flags” – marking the territory mostly. The aquaduct / bridge itself lies somewhat hidden in the landscape, and you’ll only see it when you’re nearly there. Its height is impressive, as well as the huge original ochre coloured stone blocks that hold the construction. You can walk next to it via the stone footbridge that was added in the 18th century. There are viewpoints on four sides (left, right, back and front), and at different heights. The funny thing with taking pictures is that you'll notice that the aquaduct is leaning a bit to one side (to make water transport possible), while you're used to a straight horizontal line at the top of your viewer. It’s a pleasant sight, but I wasn’t as taken by it as I was with the Pontcysyllte Aqueduct. The experience of being on top, with the water running next to you, is missing here. And also I had expected more of the natural scenery around it. Maybe it is better in Spring. Although the Pont du Gard is not near to any main towns, it is definitely worth the effort to go and visit. It's quite an awe-inspiring site to see the scale of the bridge in person and I did a lot of walking around to get views of the structure from different perspectives. The admission cost is quite reasonable and I would highly recommend getting the ticket that gives you access to the museum and takes you on a guided tour of the aqueduct channel on the top level of the bridge. The museum has excellent exhibitions that explain the history of the site, and I don't think you can really appreciate how it works until you walk along the top level. The management of the site has done an excellent job of preserving the site, offering an authentic historical experience, but also creating an enjoyable visitor environment. I love that you can have a picnic on the sand or go for a swim in the river on the a summer's day, if you want. The Pont du Gard is one of the iconic masterpieces of Roman architecture and engineering, and one of France’s most famous and recognizable landmarks. It is the highest of all Roman aqueducts and one of the best preserved (similar to its equally famous counterpart in Segovia). Apparently, it took just 5 years to build and was in use for a good five centuries to provide Nimes (Nemausus) with fresh mountain water. The bridge next to the arches was only built in the 18th century. There are 3 tiers of arches, and in summer, there are guided tours (for a supplement) on the top tier (labelled “canalisation”), which was really quite interesting. It can be easily reached by bus from Nimes and Avignon (the stop is on the roundabout on the main road, from there it’s just a 5-minute walk to the ticket counter). On a hot summer day, however, most visitors seem to come less for the monument itself than for the leisure opportunities (swimming, canoeing, sunbathing, hiking). Even if your visit is for historical reasons, you can always dip your toes in the cool river water. One of the best ancient sites anywhere. Pont du Gard is one of the most iconic remains of the Roman period, and I was glad as I finally could tick off this WHS in June 2013. Actually it was my second visit, but I have only sparse memories of a stopover on the way to Spain with my parents when I was a child. At that time access was free and it was possible to walk along the water conduit at the upper level. Pont du Gard is really impressive, by its height and by its state of preservation. When we stood on the banks of the Gardon, we looked up at the top tier and tried to see the skew of the bridge. But it is not visible, the bridge descends by only 2.5 cm. But you can easily see that the span of the arches varies. And: it's not the bridge on the 5 Euro note. The drawings on the Euro banknotes depict archetypes, not real buildings. Take a 5 Euro note and compare, you will easily notice the major difference: in the real bridge, the piers of the lower and the middle tiers are in line one above another; probably to reduce the load on the arches and to enhance stability. From a shorter distance, you see the protruding stone blocks that were used to fix the scaffolding. This is certainly a WHS where the weather crucially contributes to the pleasure of the visit. Our visit was on a wonderful sunny day. We climbed the trails on both sides up to all the viewpoints and took photos from almost every angle and distance. For photographers, I would recommend to visit Pont du Gard in the afternoon when the sun shines from south-west on the 'better side' of the bridge (the side without the attached road bridge). We finished our visit with a nice walk through the olive groves back to the parking lot. We visited long ago in 1988. At that time it was totally devoid of attendants or parking charges. We were free to roam ,cross and climb where we wished, in fact my wife and daughter crossed via the water course tunnel and myself and Andy (our daughter's friend) actually crossed on the very top.It was quite disconcerting to have to pass by people coming the other way,(with 2 kids and a dog!) when there was no protection whatsoever. I have some photos taken of the experience if you would like to see them. Purposely hidden from the road, this magnificent sight fills you with awe and wonder. It is so spectacular. Take a picnic and spend the whole day under the aqueduct, simply admiring its magnificence or paddling in the water, which is quite shallow at this point. Boats can be hired too. Not a cheap place to visit but sights that blow you away. Has something to offer all of the family. The roman bridge of Pont du Gard is a real marvel. Crossing the Gard River, the bridge has been well renovated to allow visitors to enjoy the place in the best possible way. 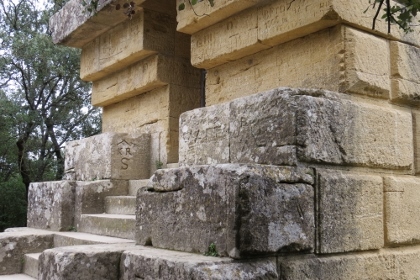 A museum have been set up at the entrance of the site and offers greats explanations and testimonies of the Roman life and mainly, the building of the bridge and its techniques. It is possible to walk on the first level of this three-level bridge. 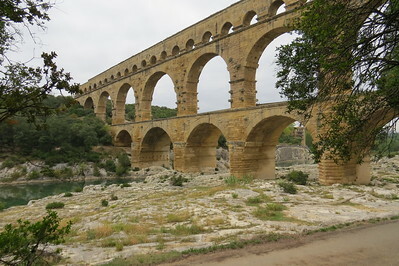 Almost 50 meters high and 275 meters long, the bridge was part of the 50 km aqueduct carrying water from Uzès to Nimes during the Roman period. The Pont du Gard is a must see BUT it is no longer free...18 euros per car with up to 5 passengers. Also beware that in winter many of the extras inside the area are closed. But we still thought it an awe inspiring site. We visited this site in July 2008 from Avignon and the bus schedules has vastly changed. There are now over half a dozen buses a day leaving for the Pont du Gard so it is much more convenient for tourists. We took the 10:45 one there and took the 1:15 one back to Avignon, spending almost 2 hours (more than enough time for us) to view the site. It was worth the effort and best of all, it is free to enter. It is quite impressive to see infrastructure on the World Heritage list, and this site is very deserving of its place on the list. The structure is absolutely massive and an astounding feat of engineering. 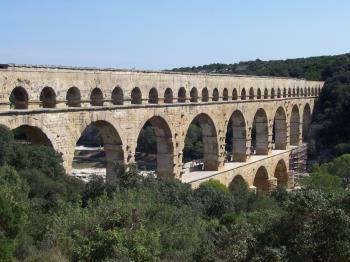 It is 50 metres high and is part of the aqueduct that ran to Nimes over a distance of 50km. If you look closely you can see that the arches are not actually the same size but vary slightly. The top tier has the aqueduct running along it. It is possible to have a guided tour of this. I did climb up the banks with the hope of seeing inside, but unfortunately you can only see a locked door and a staircase. It was worth the climb though, as the view was very impressive (picture). You can walk across the bridge for free; well you actually walk on the 18th century one built next to the roman structure at the first level which mirrors it so you can’t see the difference from a distance. There are great views from the picnic area on the left bank and plenty of trails off around the area if you fancied a hike or cycle. If you want to go for a swim take an old pair of shoes as the water is very rocky and very cold; we found this out the hard way. On practical matters, there is a brand new interpretive centre on the right bank. Busses will drop you off near here. There are 3 buses from Avignon (the most useful leaves at 12) and there are slightly more regular buses from Nimes (worth a visit). A WARNING though, there is a bus stop at the entrance to the car park but busses do not stop here or even go past!!! And the times displayed do not relate to the actual times of busses; it was only thanks to a helpful parking assistant that we didn’t get stranded. This is an impressive site and makes a great day trip from any of the nearby cities. If you want to see how important this structure is have a look at the ‘fictional’ bridge on a €5 note and compare it to this one! 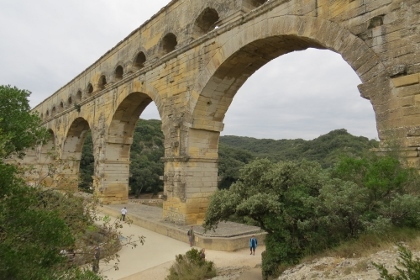 In our trip to France we have seen the Roman Pont du Gard, a part of the aqueduct that brought water by a 50 km long canal to the castellum divisorium of Nîmes, in the Narbonnaise region, from a spring near Uzès. To achieve an average of 34 cm par one km it follows sinuous pats or traverses the rock layer with galleries or is elevated on to walls or arches or bridges. 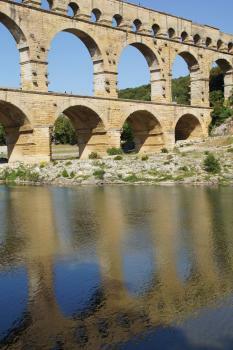 The Pont du Gard goes over the deep valley of the river Gardon; it was constructed in 19 for order of Agrippa. It’s 49 m high and has three storeys: the first (142 m long) has six 22 m high arches and was used in Medieval times like a bridge, the second 8142 m long) eleven 20 m high arches and the last (275 m long), where runs the canal, thirty-five 7 m high arches. There was also adaptations of the devastating course of the river and the lips on the piers, the curved layout of the aqueduct and the opening of the main lower arch are designed to resist to the floods. The acqueduct use at the two lower levels stone blocks, that can weight up to six tons, and at the upper levels small stone rubble which hold the abuting flagstones of the canal. The acqueduct is one of the most beautiful places I have ever seen because of its impresivenesse and its incredible technique of consctruction; it's absolutely worth to be visit - you must park 500 m from it. It justifies the inscription also as the nicest Roman acqueduct in the world, one of the few incribed on the WHL, and the best exression of Romans' technique, but I think that also other Roman monuments in Provence (like that in Nîmes or Saint-Rémy-de-Provence) could be inscibed alone or together with one, two or all of the WHS of Arles, Orange and Pont du Gard. 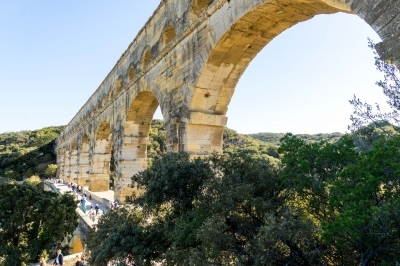 Each time we have visited the Pont du Gard (Bridge over the Gard River), ten or twelve miles northeast of Nîmes, the weather has been sparkling clear, but rain or shine, it’s an awe-inspiring structure. The aqueduct was built without mortar between the stones (some weighted six tons), and we know engineering codes wouldn’t permit that these days. Of course it’s most likely that structures built under our engineering codes won’t last 2,000 years, either. The first times we were here we were able to drive across the bridge with no problem, but on our fourth visit, police had blocked access to the road. The next morning, the police were gone, and we again drove across the Pont du Gard. Why is that so exciting, since we’ve done it a couple of times? Well, who else do you know who has done it even once? 310 Community Members have visited.